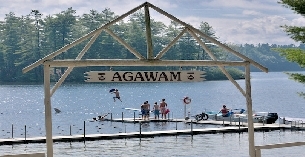 Founded in 1919, Agawam is a traditional residential camp for boys located on beautiful Crescent Lake in Raymond, Maine. Our rustic campus offers a unique combination of woods and athletic fields. Agawam offers a range of activities from sports (tennis, basketball, lacrosse, soccer, baseball) to water based activities (swimming, sailing, canoeing, windsurfing) to nature and outdoor based activities (wilderness tripping, camp craft, high and low ropes course) to the creative and performing arts (woodshop, arts & crafts, music) to traditional target sports (archery, riflery). Camp Agawam is and always has been a camp centered on character and youth development. Boys certainly have a lot of fun while they learn and hone activity skills, but the real value of a summer at Agawam is the personal development and growth in character, leadership and responsibility. An Agawam summer is about building relationships, working on interpersonal and communication skills while “unplugged” from the pressures of electronics and social media. At Camp Agawam, a boy learns to become his best self. Through a structured seven-week program filled with opportunities for leadership, teamwork, and healthy competition in a digital-free environment, boys develop the character traits they need to play a positive role in their communities. Each boy leaves camp with new skills, new friends, and a new sense of his own capacity, and becomes part of a dedicated alumni network that extends around the globe. Since 1919, the values of sportsmanship, service to others, and stewardship of the natural world have been at the heart of the Agawam experience, which takes place each summer on a 125 acre lakeside campus in Maine. Camp Agawam, located on Crescent Lake in Raymond, Maine, is a traditional seven-week summer camp for boys. The essence of Agawam is our rustic, uncomplicated environment with much opportunity for fun, challenge, and growth. Campers enjoy sunshine, cool breezes off the lake, woodlands, rolling open fields, lots of wildlife, starry skies at night and the memorable cry of the loons. An important guideline for our community is to "be the best, whatever you are."